I have always been a fan of Chick-fil-A. I love that they serve high-quality fare and their service, is second to none. Every Saturday morning at 6:30am, I am at our local CFA picking up a Gallon of Unsweet Iced Tea. While I do love their Chicken Burritos, we normally don’t eat at CFA too too often. I’d say a handful of times a year but, other than that, that’s it. Last month, CFA came out with some menu changes – something they do very, very rarely. While none of the salads were of interest for me, I knew I wanted to try the Chargrilled Wrap. A fan of the previous wrap, I was looking forward to digging into A Whole New World. I always liked the old Chargrilled Wrap from CFA but was shocked with the amount of calories in it. With the new wrap, this number has been greatly decreased due to the new wrap that is used and, by my estimation, that the wrap is much smaller. 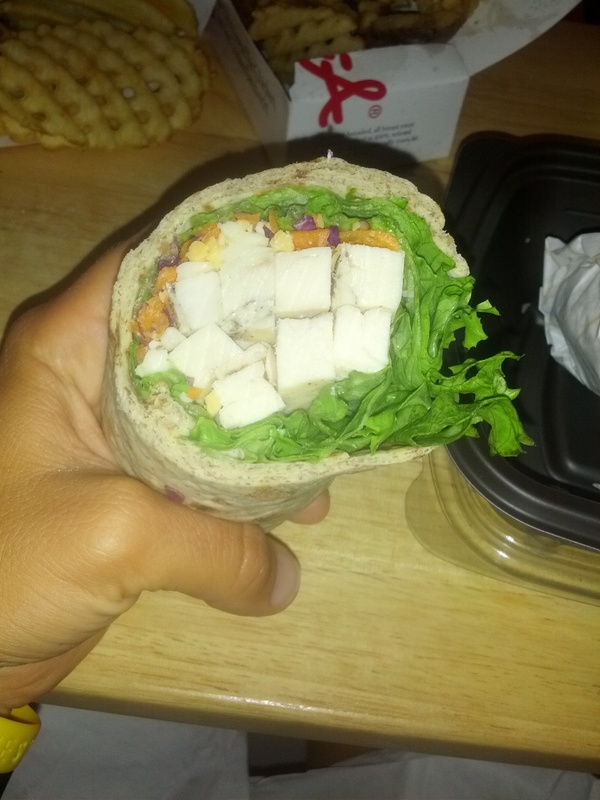 Last Friday night, we picked up CFA for dinner and I tried the wrap. I ordered this with the Honey Mustard Dressing but, it was not until I got home that I realized they forgot to give it to me. In a means of extreme hunger, I took these images with my phone in dull light so, my apologies now for the lack of clarity. The interior of the wrap was the same as before – cut pieces of chargrilled chicken, lettuce, tomatoes and cheese. I find the chicken to be fine…nothing too good or too bad. 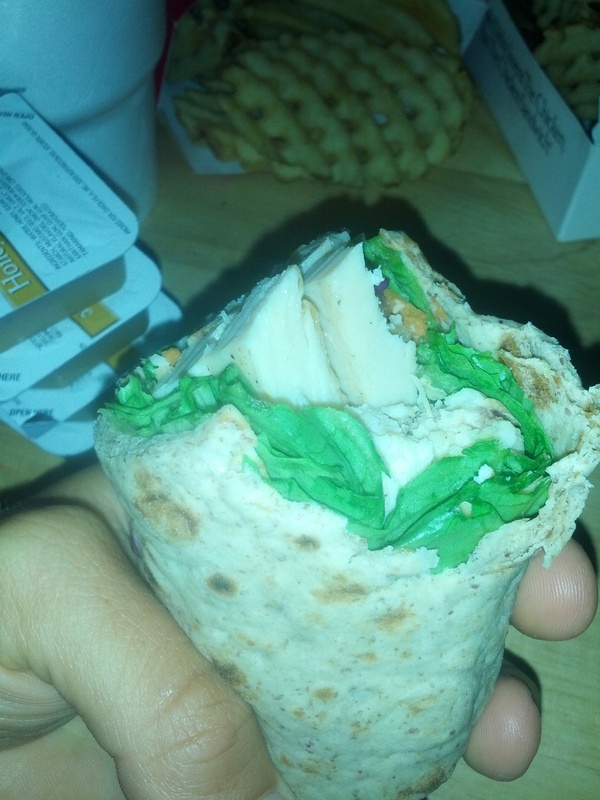 In this wrap, it was a bit dry and the lack of Honey Mustard did not help. While I did use some of the Honey Mustard dipping sauce, the dressing certainly goes much better. 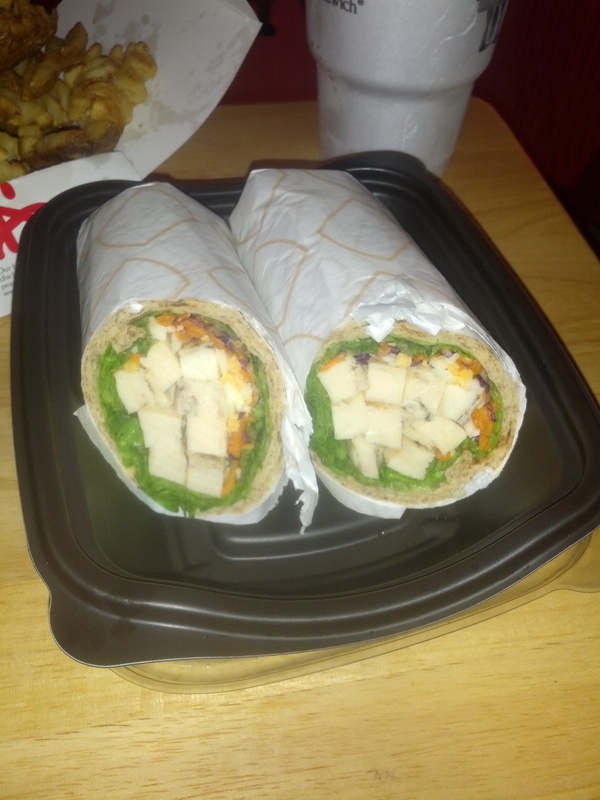 I felt as if there was plenty of chicken in both sides of the wrap. The lettuce, tomatoes and cheese were good as always – fresh, crisp and tasty. As for the new wrap, it is now of the wheat variety and a little bit thicker. I found the flavor to be pretty lacking and the wrap to be extremely dry. While the wrap did indeed hold everything together, the dryness far outweighed any new benefits. This wrap certainly seemed smaller to me than the previous wrap. Whether this is because I was starving or because it truly was, I cannot yet say. Either way, I was disappointed overall in this wrap. The wrap was always my go to and I’m not sure if that will be the case any longer. I indeed will try this again and ensure that I get the Honey Mustard Dressing. Perhaps that is all that was missing from moving this wrap from okay to great. CFA will continue serving me good food, great service and delicious tea. I, in return, will continue to visit A Whole New World. Alls you need is Syrup! !